Few weeks before the grand opening of the 2014 FIFA World Cup in Brazil, the streets of Rio de Janeiro were covered in World Cup-related street art. 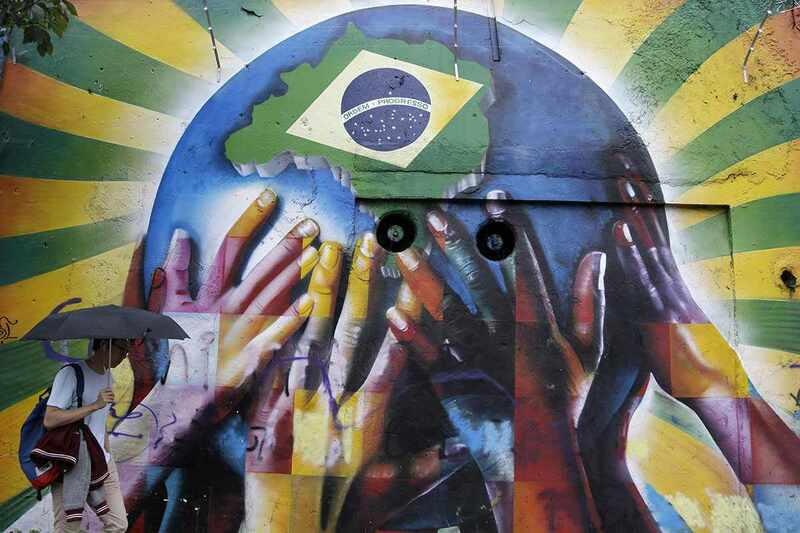 Murals revealing conflicted feelings about the enormous amounts of money spent in a country struggling with massive poverty became an instant hit among the media and soon everyone was talking about the dissatisfaction Brazilian people felt concerning the biggest event in football. 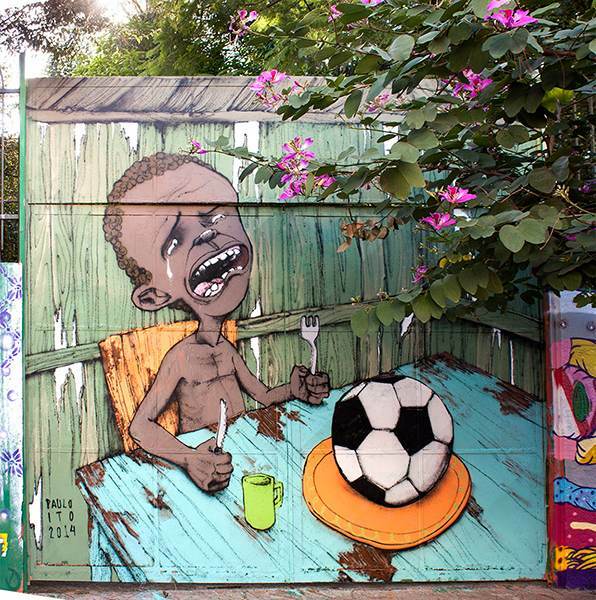 Perhaps one of the most noticeable ones was the mural painted on a school in Sao Paulo by the Brazilian street artist Paulo Ito, portraying a hungry and crying boy with nothing to eat but a football. This is a great example of the power of art that is especially noticeable in the moments of political and social discontent. However, this is not the first time Brazil used art as a political and social message. Street art in this Latin American country has a long and complex history and even though today it covers every conceivable surface and space within Brazil’s sprawling urban zones and it is decriminalized since 2007, it wasn’t always like that. This is the story of how a small art movement became a way of life for Brazilians. Today, Rio de Janeiro is considered to be a true mecca for graffiti artists of Latin America. Brazil’s second largest city is one of a kind in many ways but, when it comes to street art, there is no place like Rio. The turbulent, vibrant and energetic vibe of the city is alluring to everyone who visits. Since it first arrived in the city as a response to the new movement that began in New York in the 1970s, the new art expression came to Rio and was initially carried out by kids, punks,students and professional artists. These people marked the walls with their names or their thoughts on the military dictatorship, racism, social inequality, and the rivalry between Fluminense and Botafogo football clubs. 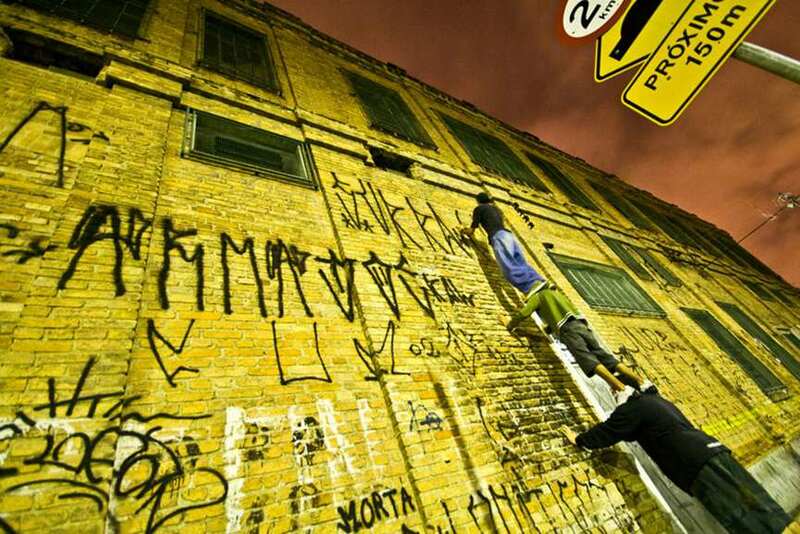 However, although NY is considered to be the home of graffiti in America, Brazil was a pioneer is something called “Pixação” – a pre-form of graffiti that consisted of tagging done in a distinctive, cryptic style, mainly on walls and vacant buildings. Pixação, also known as “wall writings”, first began appearing in the 1940s and 50s as political statements written in tar and were often written in response to the slogans painted by political parties across the streets. “Piche” is the Portuguese word for tar, so pixação refers to writings made in it. 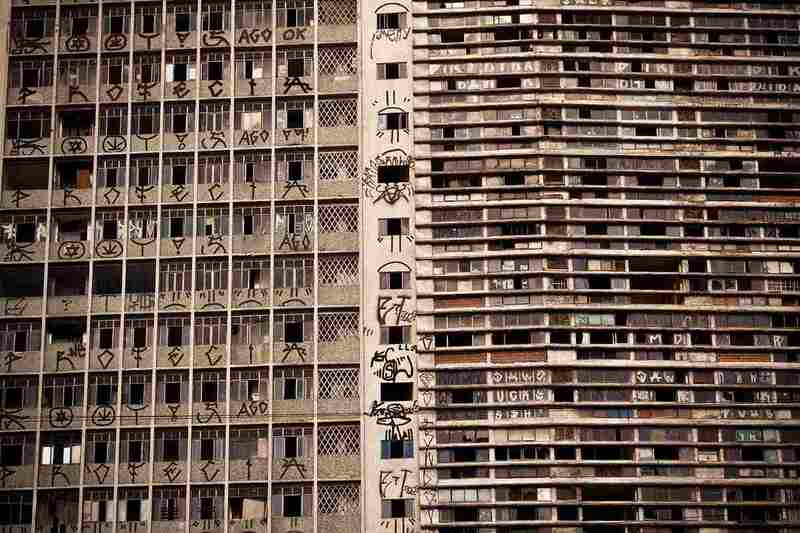 This unique form of graffiti , native to the metropolises of São Paulo and Rio de Janeiro, consists of cryptic tagging. The interesting thing about pixação is that people are always competing, trying to paint in the highest and most inaccessible places, using even free climbing and abseiling to reach the most impressive locations. Even though the style emerged during the 1940s, until 1970s pixação almost disappeared. However, it was revived a decade later by a group of kids who began writing their names, and the names of their crews, instead of political slogans. Even though it lost its initial role as an artsy way of promoting and fighting for political ideals, it is still a social statement. Brazil being the country with the worst wealth distribution in the world that causes a massive financial difference and creates two social classes – the poor and the rich. Pixação exists on the very surface of the contested wealth as a reminder to the rich ones. 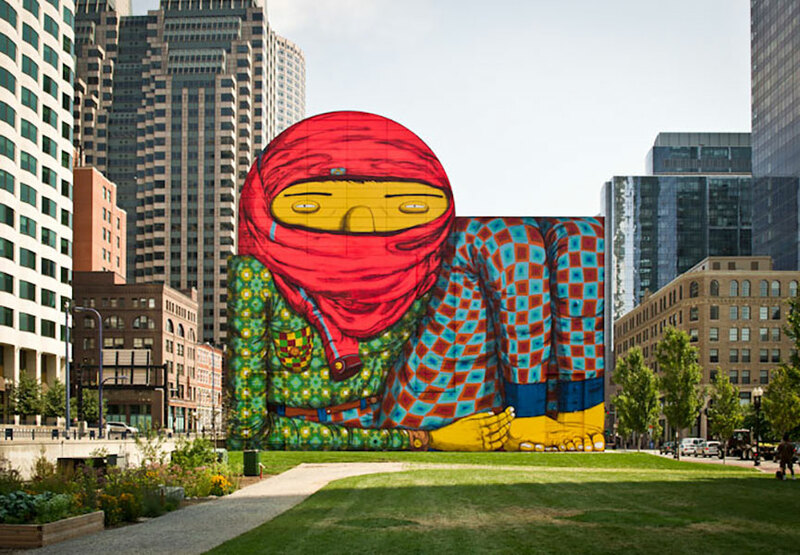 Pixação being a relatively easy and creative way of expressing opinions and emotions, became an inspiration and foundation to the work of many Brazilian street artists like Os Gêmeos and Nunca. But, not only Brazilian born creators find inspiration within the country’s energy. 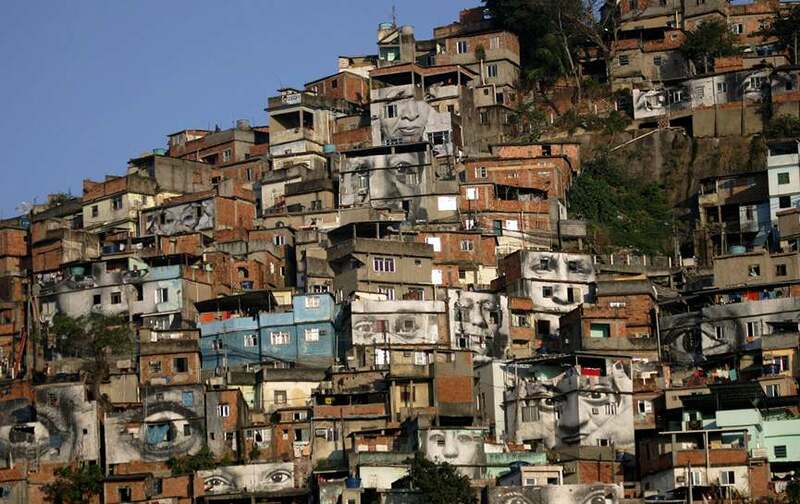 For example, French artist JR famously covered Rio de Janeiro’s Providencia favela with the eyes and portraits of women who had lost their loved ones during violence with the police. Today, street art in Brazil adorns almost every wall and free space. The production of street art, particularly forms of muralism and graffiti, accelerated at an unprecedented pace from the mid-1980s in Brazil, coinciding roughly with the period of democratic transition, economic opening and the import of hip-hop style from the United States. After the decriminalization of street art in March 2009 with the Law 706/07, expressing yourself was never easier. 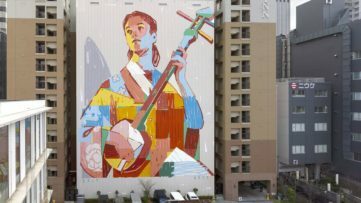 The active encouragement is highly admirable and it allows the street artists to practice their craft openly, with the consent of the building owners and residents. 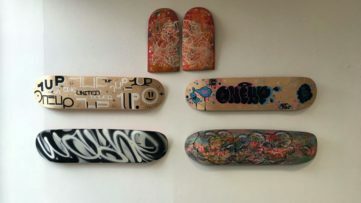 However, street art wouldn’t be what it is if it wasn’t for the rebellion element and insurgency – this is why most of the it in Brazil today is still being made without the permission of the owners. Before graffiti and street art were considered to be a criminal act, many of the world’s best names started their careers. 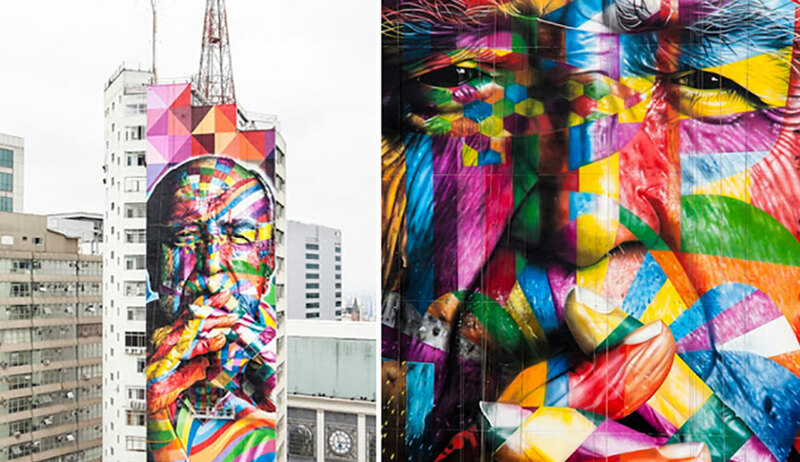 Practising his first spray strokes during 1987, Sao Paolo’s street artist Eduardo Kobra has earned his place among the best ones in the art community thanks to his impeccable technique and the ability to paint massive murals playing with 3D techniques that feature an amazing range of depth and realism. 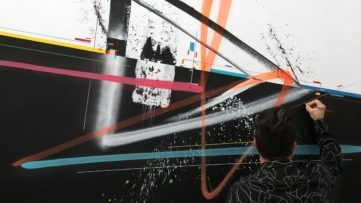 The idea behind his works is to establish a comparison between the romantic air and the atmosphere of nostalgia, with constant turmoil characteristic for large cities like Sao Paulo. 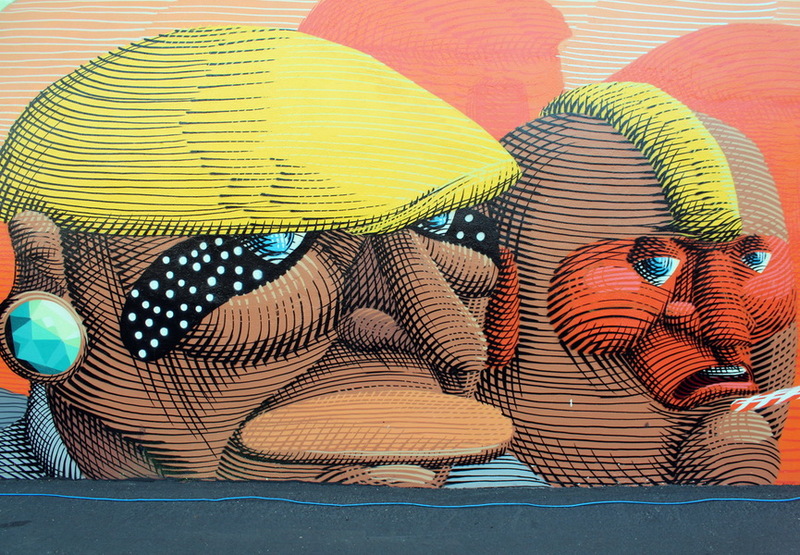 Being introduced at a very early age to the pixação graffiti movement as well as American hip-hop, the Brazilian street-art duo composed of two identical twin brothers, Otávio and Gustavo Pandolfo aka Os Gemeos are one of the most popular artists from the country. Their murals, besides painting family portraits and Brazilian folklore, often tackle Sao Paulo’s social and political circumstances. Francisco Rodrigues da Silva aka Nunca also grew up on what is called Brazilian graffiti movement, pixação. His tag “Nunca” (“Never” in Portuguese) is an affirmation of his determination not to be bound by cultural constraints. Nunca creates striking, intensely colored work inspired by indigenous Brazilian culture and creates images that confront modern urban Brazil with its native past. Art has always been the best form of an expression, however, in times of social and political problems and conflicts, the power of art becomes especially important. Brazil, being a country with a long lasting problem of poverty, found a way of dealing with the everyday struggles and pressure. As the author Tristan Manco wrote in his 2005 book Lost Art & Caleb Neelon – Graffiti Brazil, social factors contribute to a very fluid society, driven with those economic divisions and social tensions that underpin and feed the “folkloric vandalism and an urban sport for the disenfranchised”.